it feels like it’s been a little while since i’ve played a pac-man game. actually i’ve played a few off and on, but i haven’t sat down and “finished” one in a while. one game that i’ve come back to several times but finally sat down and spent a concentrated amount of time with was pac-attack, as it appears as part of pac-man collection for GBA (a SNES version was also released, and a version also appears as a bonus (in a remade version) in pac-man world 2 for gamecube and other platforms). this is the third game of that set of four that i’ve played, and of the four it’s the one that suffers least from being scaled down to the GBA’s tiny screen. unlike the other three games in the collection which are based on the classic maze-based pac-man gameplay, pac-attack is actually a tetris-esque puzzler and as a result doesn’t have to rely on a tiny zoomed-out perspective or a board divided across multiple screens. i haven’t played much of the other versions, but on the GBA the game looks great and not painfully small. lest you think it’s a mediocre tetris clone, let me be quick to say that the game is actually one of the better tetris-based puzzlers, and for me ranks closely behind the classics panel de pon (aka tetris attack) and puyo puyo. despite it being similarly addictive, the game isn’t nearly as immediately gratifying, and the pace of it feels slower, in part due to the fact it doesn’t really have any combo system. 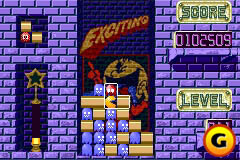 instead, the game provides three-character blocks which consist of all blocks or all ghosts, some combination of ghosts and blocks, or a pac-man plus two blocks, and its main objective is to line up a trail of ghosts and then unleash your pac-man to gobble them up and cause the subsequent falling blocks to form rows. since a block containing a pac-man comes regularly (every fifth block), when forming long chains of ghosts part of the task is to discard the pac-men you don’t need while not screwing up the big score you’re creating. also, it seems a bit counterintuitive, but eating a long chain of ghosts doesn’t seem to net you a lot of points; rather, your focus has to be on the blocks falling into place into rows after you’ve cleared the ghosts. this obscured objective definitely makes the game harder to get into. also, the strategy for placing the blocks is itself more like games such as pipe dreams where blocks have functions as end pieces or middle pieces (in this case, of a string of ghosts), and again, having to think about these uses of the blocks while positioning them does make the core gameplay more of an effort than most others. still, once you absorb the nuances of the gameplay the game is quite fun. but even though the gameplay is solid and satisfyingly challenging, even after playing for many enjoyable hours the game just doesn’t quite reach the level of the greats. like games like wario woods, pac-attack is fun but the mechanics are just a bit too fussy. nevertheless, i enjoyed my time spent with it and feel my skillz definitely have room to grow. i achieved a high score just shy of 500,000 so i’ll definitely be picking it up again at some point to at least break that barrier. attack of the pac-attack links! – the game’s apparently actually based on a game called cosmo gang the puzzle. the game baku baku by sega that followed pac-attack by a few years features somewhat similar gameplay.